London has become such a usual travel destination for Central and Eastern European people that it would be difficult to surprise them with anything. Cheap flights to most European countries allow going there for business or for pleasure separatly, without the urge to explore everything possible in one go, and some people already go there only for shopping, or academic events, or to visit friends. There used to be stories of commuting doctors. The city, obviously, is so huge and diverse that whatever patchwork of stories you may have heard before, they will not come together to a coherent entity. As I went to visit there for a second time, my goal was to challenge some of the initial not-so-positive impressions and to finally experience the legendary cultural life to its fullest. The impressions that I brought with me were shaped by many expat friends, but more importantly, a 1.5 day visit in May 2011. Me and Dalia explored one of the hipster neighbourhoods (which was alright, but nothing special), saw one of those experimental art / awareness raising exhibitions about war in Lebanon, observed squirrels in a park close to the Buckingham Palace, guard-changing mess with hordes of tourists on the street, and a pro-Palestinian demonstration close to the Parliament. Dalia posted some pictures on her photoblog. Don’t forget that the William&Kate madness was still lingering on. We took pictures of tourists taking pictures, and looked at souvenirs with the iconic couple. This time the plan was to visit a theatre, at least a couple of museums and a concert. I was also hoping to meet all my London-based friends from at least five countries. Yet the official purpose of my trip was attending a three-day-long conference at LSE. Knowing that LSE is centrally located, I hoped that, with one cultural activity per evening, I can meet everyone and meet the plan too. Unfortunately, very quickly it dawned to me that things can’t be planned like that in this megacity, with its legendary messy transportation network. I even downloaded the London Tube app, but without a permanent mobile internet connection it’s less useful than it would be. Oh well. Tokyo is bigger than London, and I found its public transport very clear. In Cairo, underground transport is marginal, so it’s difficult to compare. The problem that I had was my initial bad experience with the Tube and London’s transport in general, which made me and Dalia skip one gallery we wanted to see and almost miss our flight back. It seems that something on the Tube is always out of order, but you never know what exactly. So I felt that I must always check everything twice. ‘You need to run in the Tube to make it on time,’ says my friend B., three years a Londoner. I had to skip theatre and a concert, but I still have some picks for the blog. 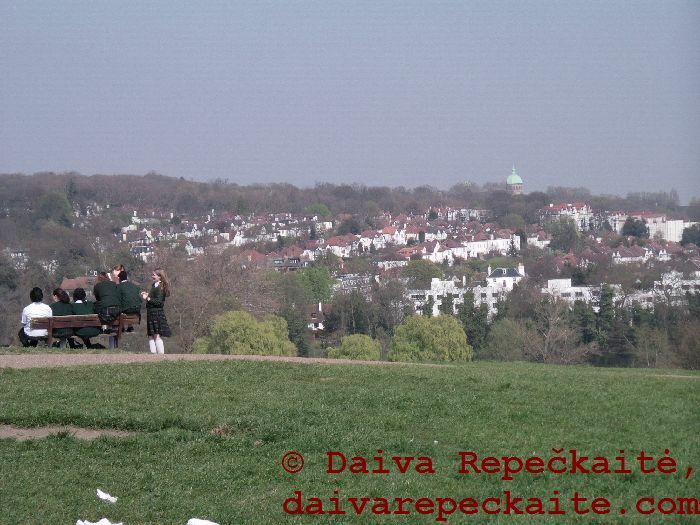 Parliament Hill is said to be the highest point in London, where you see a panoramic view of the whole city. It’s worth the climb in spring – not sure about other seasons. From there, the Highgate Cemetery is just a few minutes walk away. And it’s a very pleasant walk. Most tourists go there to see the grave of Karl Marx. There’s a big metal head, and posing for photos is officially forbidden. Some tourists circle around like vultures, waiting to be unseen by fellow tourists and catch that rebelliously illegal picture moment. 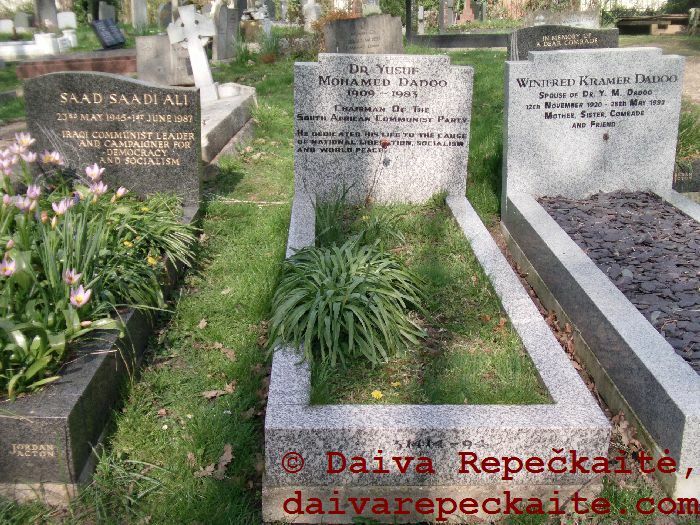 Nearby, prominent communists from various countries are buried. It’s interesting to see their work listed in their epitaphs, while many others around are to be remembered as wives, fathers, etc. 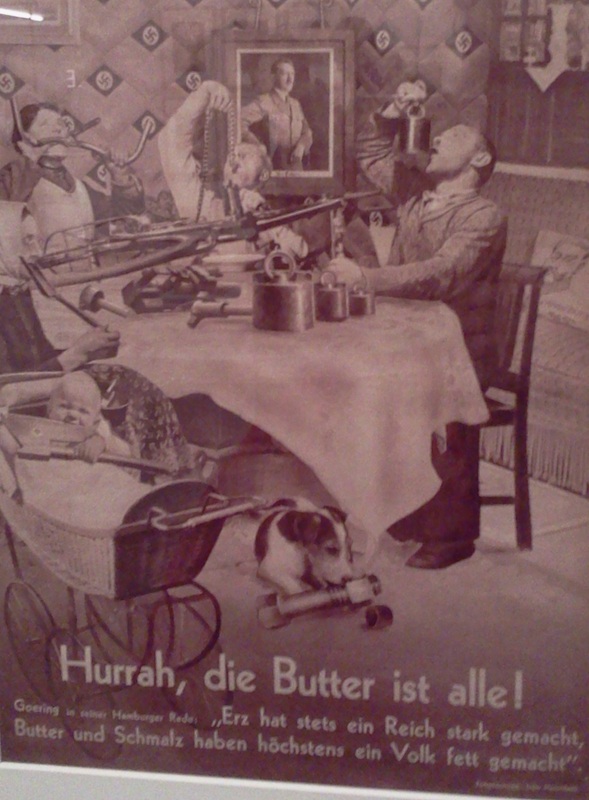 And then, to complement the socialist experience at the cemetery, there was an exhibition of works by John Heartfield at Tate Modern (thanks, Tate Modern, for allowing to take pictures). This admirable artist supplied wonderful humorous cartoons for anti-Nazi resistance, making fun of Nazi propaganda in a creative way. London’s plentiful parks also make a nice afternoon. Waling along the river is not so cool, unless you like crowds of tourists and expensive wafles. Three interesting moments from two visits: strange/interesting electronic music; tourists asking random passengers ‘Where is McDonalds?’ In French; people actually hiving coins to someone who draws their flags on a long roll of paper. Shopping (or window-shopping) for books is always fun. 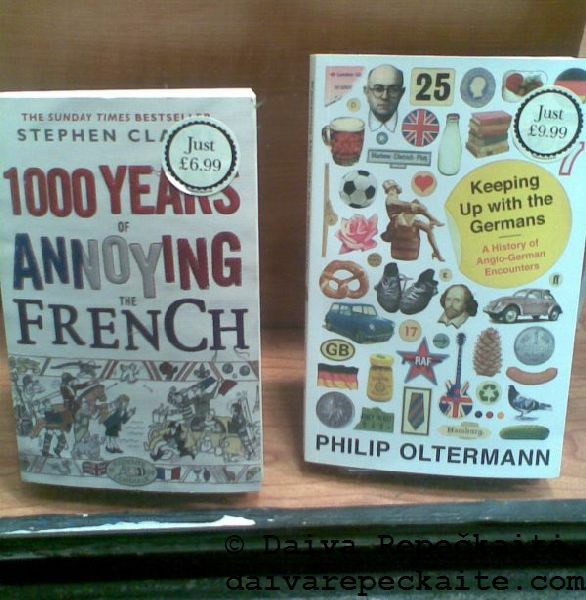 London’s bookstores care to show how much they value good international relations. I happened to go to Merylebone for a dinner. I would have never discovered this neighbourhood myself, and B. admitted this would not be a place where he would look for a cosy pub. But there we were, and Prince Regent’s Pub appeared to be quite fun. Including occasolnally overhearing exchange students’ conversations. Something specific to British nightlife is that pubs close at 11 – this is a result of a licencing policy. Around 15 min to the closing time, bartenders announce that it’s time to get the last drink. So British people start drinking early, and for everyone else nightclubs and specialised pubs, which remain open after 11, are the default choice. One of them was ‘Enterprise’ – one of these local neighbourhood pubs with some fence around, so one can also stay outside in a fenced area – so it is legal to drink on the street, because it is not effectively street. Soho’s cosy and bustling ‘Ain’t nothin but‘ blues bar was an interesting choice for a Monday evening – Monday is today’s little Wednesday, which is yesterday’s little Friday, or..? People start gathering already at 7, and those who come between 9 and 10 or later (standard going out times in most of Europe) have to queue quite a bit. It was worth it, not only because of the jam session, presenting some of London’s young talent, but also for the queuing experience on a warm spring night, when some people try to use their doubtful drunken charm to get inside before others or spontaneously flirt in at least four languages. The bouncer is fair – and merciless – to all. Another evening L., B. and I picked a random bar on the Portobello Road in Notting Hill. The place had a very local feel, it seemed (quite untypically for London) that we were the only non-British people, and that many knew one another. Someone approached us to say something about his dog in a dialect none of us understood. I still would not call London one of my favourite European capitals, but it is an easily accessible megacity with endless opportunities for spontaneous interactions. What impressed me most was that people were exceptionally friendly, something you wouldn’t expect in such a large city. When my public transportation card appeared to be out of money, and I had no change, another passenger simply bought me a bus ticket. Receiving detailed instructions for getting to places with a smile and lots of details is also not something I would expect in a city where everyone is so busy. Do you know any expat blogs in London? Share them in comments! 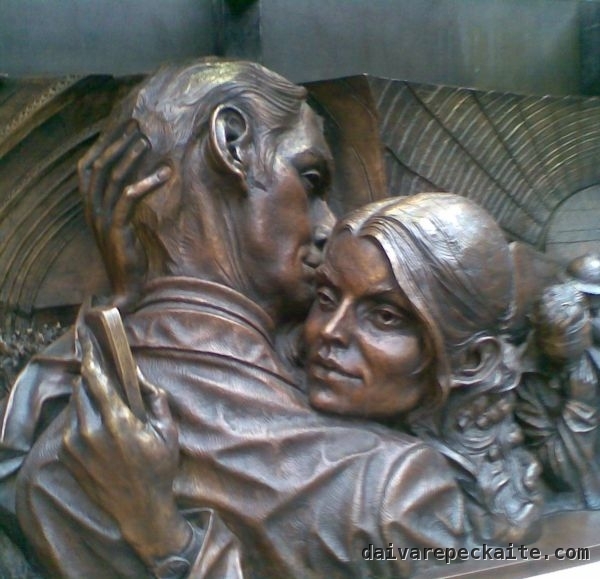 This entry was posted in Travel blog and tagged culture, london, travel, urban on 2012-04-08 by Daiva.